Cleaning supplies from the Muc Off Gods! 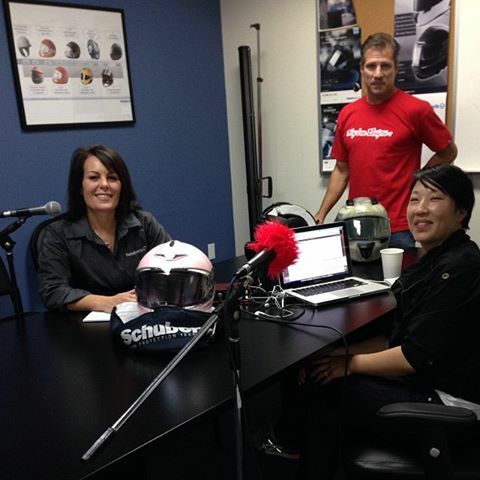 At the Women's Sportbike Rally West in July, we had a really great workshop with the owner of Motorcycle Service Centers, LLC in Camarillo, CA. (an excellent metric or harley shop in the Ventura County Area The topic was "How Not to Get Ripped Off by a Motorcycle Shop". It was one of the most informative workshops I've ever attended. Thanks Will! If you're new to riding and aren't quite sure about things, getting to know your ride up close is important. I am so lazy when it comes to cleaning Goldie and keeping her nice and shiny. But I'm hoping with this awesome care package from MucOff, it'll help me keep Goldie looking like she's 2012 again. Now I have ZERO excuses for not keeping everything looking pristine. 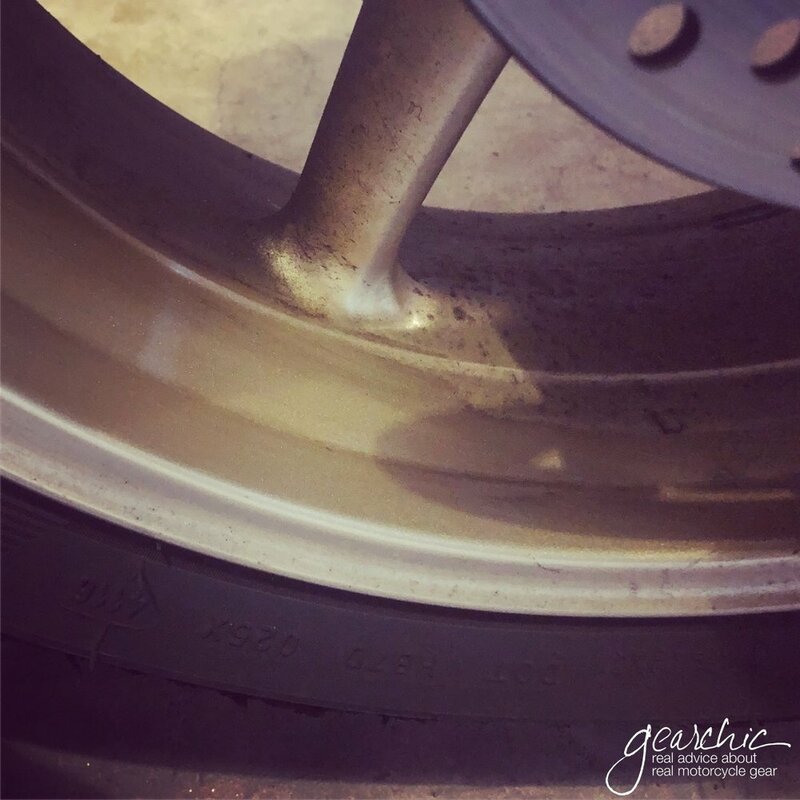 See how disgusting my wheels look? See that awesome clean patch? 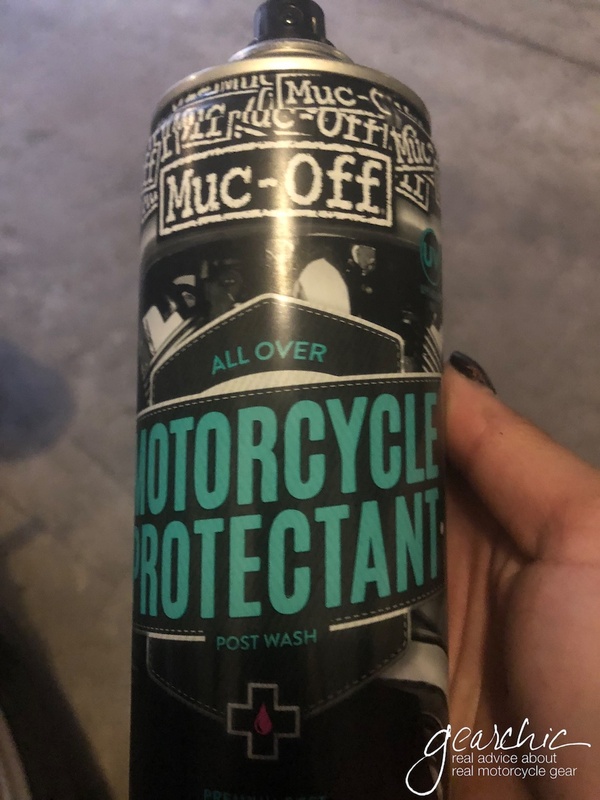 Normally I use Simple Green to wipe down my wheels but I thought I would give their "Motorcycle Protectant" a try; its like the 409 of motorcycle cleaners. One spray, and then one wipe and it perfectly removed my brake dust. LOVE it. I'll admit I haven't used the entire kit yet, but I can't wait until it's not 1,000 degrees anymore so I can sit in my garage without melting to give her a long overdue wash. I'm on my way to the Iron Horse Motorcycle Lodge near Deals Gap, NC for the Women's Sportbike Rally so I hope the rain doesn't stick around too much so I can give Goldie a good top to bottom scrub. But at home, I don't have a hose hookup so using some of these products is really helpful (meh, condos). With just the Protectant I can clean her up top to bottom in a pinch. 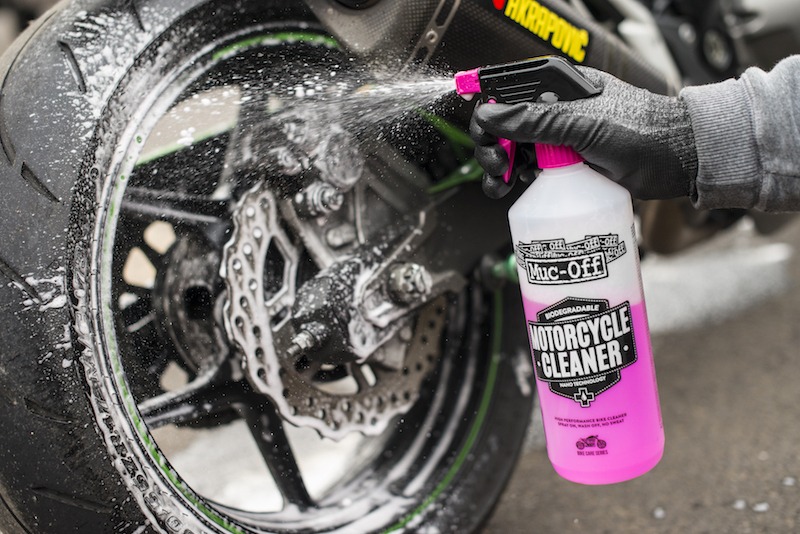 If you do want to give your bike a full wash, they offer a Nano Tech Bike Wash (instead of say, dish soap). 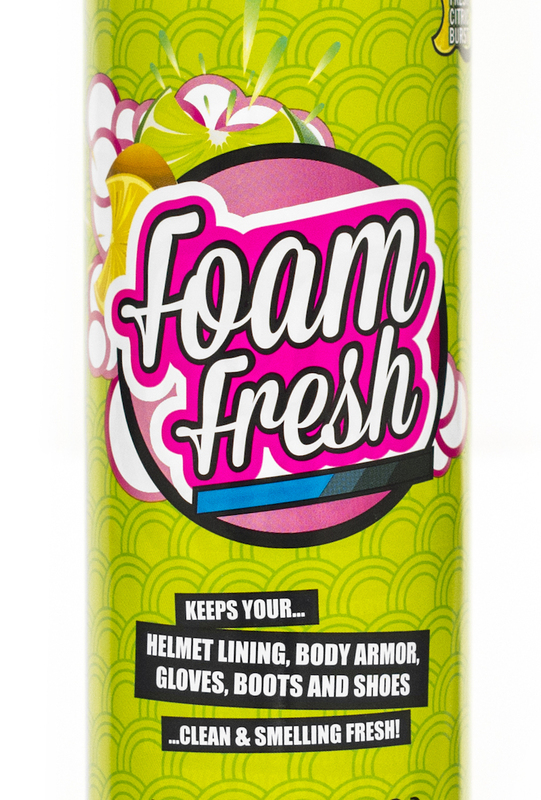 One of my other favorites is the Foam Fresh. I like to clean my helmet liners every month or so during peak sweaty, humid, hot riding seasons. The Foam Fresh is perfect for that. Did I mention how much I love Citrus Scents? Normally you can hand wash your liners but I am #lazy so I'd rather take them out, then spray and wipe clean to air dry. These are just a few of my favorites from their collection I'm excited to use. Looking forward to testing everything out, check my Instagram feed for photos and updates in the coming months. If you've never heard of Moto Shop, go Now! 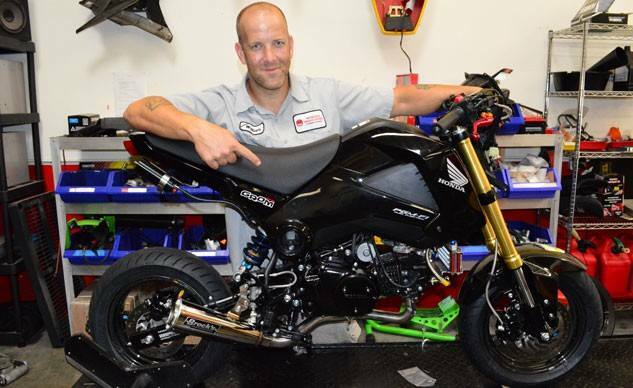 Moto Shop is the first do-it-yourself motorcycle shop in South San Francisco, CA. All you need is to ride your motorcycle or scooter into the shop and they will have almost everything you need to fix or spruce up your bike. Stations can be rented hourly, daily or monthly. Pick up a gift card today for your favorite motorcycle or scooter enthusiast. See all the pricing options here. So I recently purchased an Arai Pinlock AntiFog Shield. It works quite well, as I don't have to flip my visor up every time I come to a stop in order to clear up the fog. It's not 100%, but it definitely works most of the time for me, and far better than not having one at all. I'm really happy with the Pinlock and can't wait to use it as the weather gets colder. I was thinking about what I've read of people's experiences with the Pinlock; that it doesn't really work. The only thing I can think of as to why it wouldn't be working for some people is if they aren't keeping them clean. After awhile, if your Pinlock has stopped working, try rinsing it with lukewarm water and drying with a soft, lintfree cloth (microfiber is always good). If you're at all familiar with Scorpion Helmets, (a great helmet at for under $250 with a fiberglass shell) then you may know that they come with antifog shields. At Scuderia we always tell people that as soon as the antifog stops working, to clean them with just water so they'll start working again. The Pinlocks probably work the same way. So if you're having trouble getting your shields to keep working, clean them! I also read on Pinlock's website that they're coming out with a shield that has a recessed visor that goes all the way to the edge of the visor, and without pins. So if you're bothered by the border on the inside of the visor, this may be a better option for you. If any of you have GORE-TEX products, the same rule applies. If you go to their website, they have a page giving you full washing instructions for gloves, boots, etc, pretty much anything that has GORE-TEX in it. They even have a page about Restoring Water Repellancy. I've also heard many people complain that their boots aren't really waterproof, that their pants stopped working. Well, maybe if you cleaned them once in awhile, they'd start working again! If your garment comes with GORE-TEX, there is probably a little tag that says so, along with more information about caring for it. So before you give up on your gear, give it a chance. Clean it, take care of it, store it properly. All these things can extend the life of your gear! Nik-Wax works really well for textile GORE-TEX jackets and pants. You don't want to use household detergents like Tide on your gear. This is specifically made for maintaining water proof textile clothing. Simply take any armor out of your garments first and then set the delicate cycle, cold wash and cold rinse, on your washing machine and let her go. I've washed my old Revit jacket and FirstGear overpants (both waterproof) with them and they really did preserve their water repellancy. I never had any issues with them after washing. They also have a lot of other products, including water repellancy treatment for leather products, including products for other outdoor activities as well. Plexus is an amazing industrial strength plastic cleaner. It's safe to use on your visors (except the anti fog ones of course), glass and plastic surfaces such as windscreens and instrument panels. Just one little squirt goes a long way. You always want to use a microfiber towel, instead of a paper or shop towel. They also come in a smaller, pocket travel size so you can carry one in your tank bag on long rides. Honda Polish is great for cleaning your bike's bodywork. I exclusively use this to clean my bodywork and other engine parts. If you can't get your hands on Honda Polish, try Motul Wash and Wax which some people say works better than Honda Polish. If you have removable cheekpads, this is a great product for cleaning those pads! An easier, lazier method might be Febreeze to help freshen up the pads. But if you want to do a more thorough cleaning or have some stains that you need to remove (makeup perhaps? :D), this will help you spot clean as well. It comes out as a thick foam, kind of like mousse, and you just spray it on the surface of the cheek pads, work some of the foam into the stains and/or foam and let it sit for a good 15-20 minutes. Then wipe clean and let airdry. The can may have more technical steps that I'm missing, but you get the jist of it. I need to look around for leather cleaners, so let me get back to you on that one. In the mean time, I hope this gives you a good arsenal of products to help maintain and extend the life of your gear!